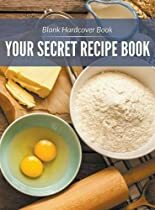 A blank hardcover recipe book is great to own because:You never have to lose a favorite recipe. The recipe and ingredient list can be researched for accuracy. Tweaks and changes to the recipe are easily noted. No one ever has to run the risk of forgetting a favorite recipe. Searching around for a recipe is no longer necessary.